You would think that the most harmful diseases tend to get the most money for research. That is not the case. Have you ever heard of anyone who ran a marathon or participated in a bake sale to raise money for chronic obstructive pulmonary disease (COPD)? Have you ever heard of the disease at all, also known as emphysema? Emphysema is one of many diseases that don't get much public attention but should. It is the third leading cause of death in the United States. However, it receives stunningly less funding for research than cancer or HIV, which in comparison cause fewer deaths. In 2004, The Global Forum on Health Research announced that only 10 percent of medical research was devoted to diseases that cause 90 percent of the world’s health burden. The gap has not been re-calculated in recent years, but it is clear that some of the deadliest diseases are still vastly underfunded. 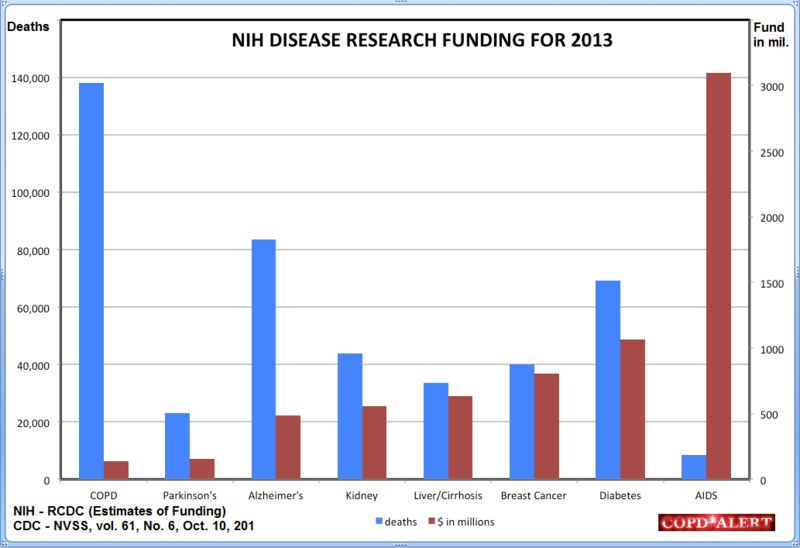 One reason for this funding gap is that we tend to empathize more with some diseases. The psychology of diseases affect our perception of need and therefore our desire to allocate money. “We tend to underfund things where we blame the victim,” said Claiborne Johnston, Dean of Dell Medical School. For example, COPD is often caused by lifestyle choices, such as smoking, and so the perception that the disease is self-inflicted results in giving less priority for funds. Another explanation for lack of funding for deadly diseases is the difficulty of the cure. Alzheimer’s and Parkinson’s are some of the costliest diseases, and billions of dollars have been allocated to find a cure. Pfizer announced this year that they wont be funding research towards a cure for these diseases as their previous efforts proved ineffective. There is a bright side to all of this. We tend to deal with one disease at a time, and when we, we do it well. When the ‘War on Cancer’ was declared 50 years ago, scientists were very effective in working towards a cure. Living with HIV/AIDS has also become much more manageable than a few decades ago, thanks to the enormous funds dedicated to research. In the meantime, what can we do to help underfunded research? The hype around certain diseases can be misleading. Do your research prior to donating. Remember that victims of self-inflicted diseases also deserve sympathy. Raise awareness about diverse harmful diseases, not just the popular ones. Below you can find two Kinder-vetted, highly effective nonprofit organizations working on medical research for deadly diseases. Foundation for the National Institutes of Health (FNIH): FNIH creates, adopts and implements new research models that uncover causes and cures for the health challenges facing our world. Cure Alzheimer’s Fund: supports some of the best scientific minds in the field of Alzheimer’s research, and does so without any financial gain for its founders or donors. The Board of Directors for CureAlz pays for all overhead expenses so that 100% of all donations will go to research.